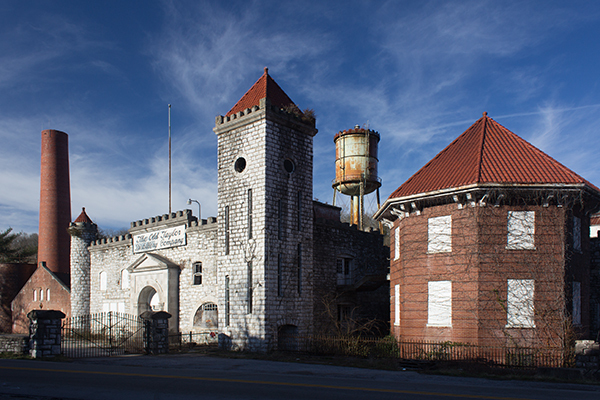 May 21, 2014 – “It’s not a question now of if, but when.” That’s how Will Arvin, one of the partners behind the latest plans to restore the historic Old Taylor Distillery, answers those who wonder whether the distillery will ever reopen. In a brief telephone conversation, Arvin confirmed Peristyle LLC’s plans to invest $6.1 million in cleanup and restoration of the 83-acre site with a goal of starting whiskey distilling in the fall of 2015. The project will be completed in phases to allow distilling and use of the castle-style main building for special events while additional restoration work on other buildings is completed. Old Taylor was built in 1887, and federal government records show it was the first distillery to produce one million cases of straight Bourbon. The distillery still has some of the 1972-era distilling equipment in place, according to those who have been allowed inside, along with one of the oldest bonded whiskey warehouses still standing. There have been several attempts to restore the distillery in recent years, but each one failed. According to the Herald-Leader, Arvin and his business partner, Wes Murry, paid $950,000 for the site. Kentucky economic development officials have already approved up to $250,000 in tax rebates and incentives for the Peristyle project, which is expected to create at least 10 full-time jobs. However, the distillery will likely carry a new name when it opens, or at least its whiskey will have a new name. Beam sold the Old Taylor trademark to Sazerac in 2009, and its Buffalo Trace Distillery in Frankfort produces whiskey under the Old Taylor and Col. E. H. Taylor brands. The distillery is located on McCracken Pike about five miles southeast of Brown-Forman’s Woodford Reserve Distillery, and just around the corner from another historic landmark, the Old Crow Distillery. Also closed by Beam in 1972 but used until recently to mature whiskey, the Herald-Leader reports Old Crow has also been sold to investors who plan to restore it and open a craft distillery on the site.